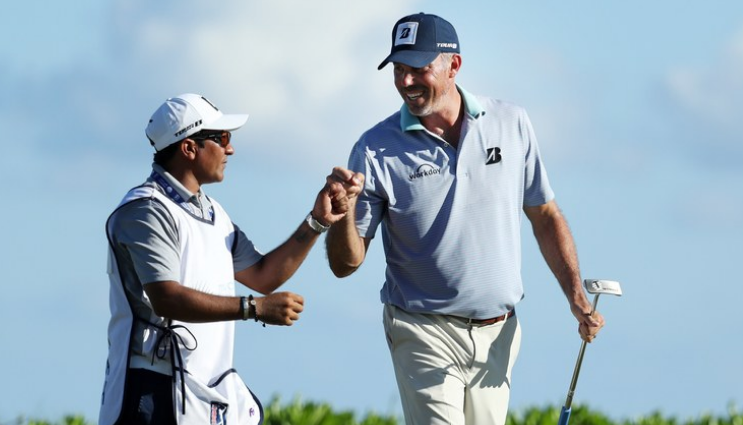 In light of Matt Kuchar possibly stiffing his celebrated caddie at last fall’s Mayakoba Classic, Golfweek’s Eamon Lynch posed the question of what constitutes proper payment for a winning bag week loop. Impressively, 10% is dominating while the $3000 Kuchar possibly paid his man brings up the rear. Matt Kuchar getting roasted for allegedly paying a local caddie $3,000 after winning $1.3m at a recent Tour event in Mexico. Curious what folks think would be fair in that scenario. Former PGA Tour player Tom Gillis took to Twitter suggesting Matt Kuchar, 2019 Sony Open leader, former Players Champion and winner of $45 million in his PGA Tour career, might want to pay his caddie this week more than the $3000 he claims Kuchar paid “David” upon winning last fall’s Mayakoba Classic. 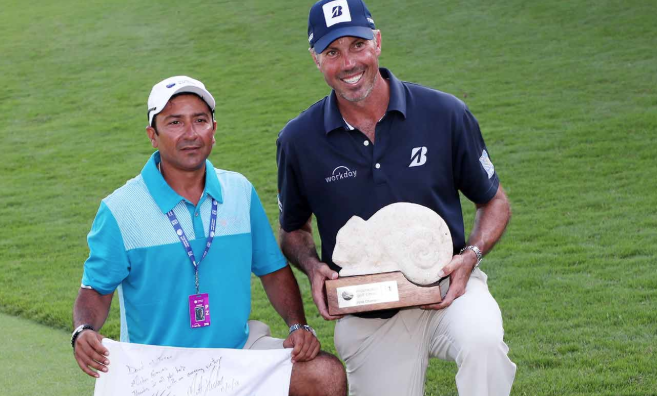 The win garnered Kuchar a $1.3 million winner’s check plus presumed bonuses. You may recall that David was a local caddie Kuchar used when he entered last minute and his normal looper, John Wood, had a previous engagement. To his credit, Gillis answered and Tweeted questions from skeptics unsure of his sources or motivations. 10. In a qualifier for the tournament, Ortiz caddied for a Mexican golfer, Armando Favela, who made it into the tournament and finished in a tie for 16th, making him the low Mexican. Favela earned $108,000. 11. Asked if he made more money than Favela last week, Ortiz said, “I hope so!” He had not yet received or discussed his pay with Kuchar. He knows the standard caddie bonus is 10 percent of the winner’s share. Kuchar earned $1.3 million for his win, his first since 2014. So far just Brandel Chamblee has come to Kuchar’s defense, suggesting the pay was legitimately fair for a local caddie. LOL Alert: Vijay Says Lawsuit Settlement Was "Good For Both Sides"
And you thought he was not a humorist! Singh, 55, also outlined his plans to keep taking up a spot on the PGA Tour by playing a full West Coast Swing schedule. Charming. In the last two PGA Tour seasons, Singh has missed 17 of 28 cuts. His best finishes came at the 2017 Players (T16) and 2018 Masters (49th). The more eccentric the swing and player, the tougher they are to mimic. And the more original the move, the greater the task for a satirist to take those bizarre attributes and one-of-a-kind quirks and still inject a funny spin. The remembrances will begin pouring in and there will be many from a golf world that has lost a beloved, dignified figure and one of the presidents most closely associated with the game. And easily the fastest golfing president. Here is Adam Nagourney’s New York Times obituary of the 41st President of the United States, father to the 43rd President and grandson to George Herbert Walker, founder of the Walker Cup. Monte Burke at Forbes posted this short tribute to President Bush seven years ago upon 41’s induction into the World Golf Hall Of Fame, but it’s a fine encapsulation of what he meant to the game. Before the memories and tributes, enjoy his World Golf Hall of Fame induction tribute where the President is interviewed by Jim Nantz. Included in that discussion is his greatest golf achievement—besides his legendary fast player status—the 1947 Cape Arundel club championship. Golfweek’s David Dusek takes a fascinating look at Cameron Champ’s driving stats after a strong fall start to the 2018-19 PGA Tour season. Averaging 328.2 yards off the tee and 1.483 strokes gained off the tee, the numbers suggest he’s on course for an unprecedented blowout in the Strokes Gained Driving. Granted, there is a long way to go but Dusek notes the last person dominating with the big stick like this was Bubba Watson in 2012. When Watson finished 2012 with the highest season-ending strokes gained off the tee average ever, 1.485, his average swing speed that year was 124.69, his average ball speed was 184.98 mph and his driving accuracy percentage was 58.85. So far this year, Champ leads the PGA Tour in average clubhead speed at 130.2 mph and average ball speed at 193.61 mph. He is also hitting 61.79 percent of the fairways. Not to diminish Watson’s achievement in 2012, but in just six years the tour driving distance average has increased. In 2012, 21 players averaged over 300 yards off the tee. In 2018, that number jumped to 60 averaging over 300. With many of “average” drivers distance-wise having been replaced by longer hitters, and more players embracing the importance of mindfulness, oat milk and physical fitness, Champ’s separation from his new peers seems even more impressive. Ok, no one has made that call. But I am now! 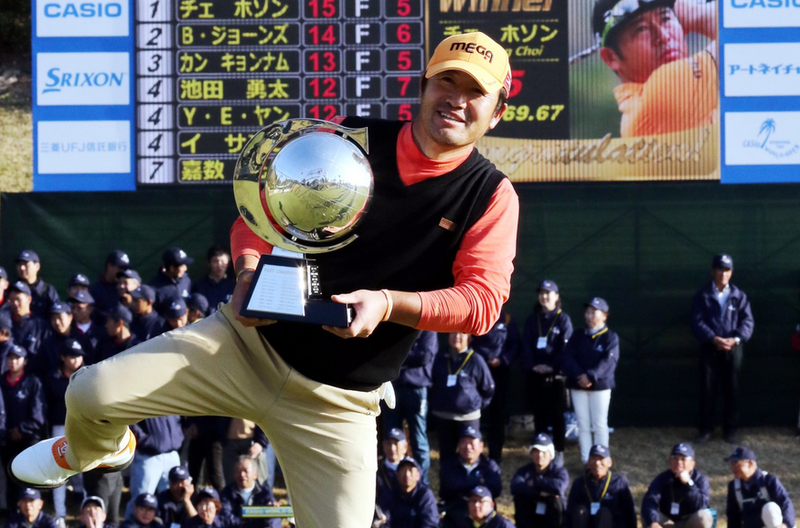 Ryo Ishikawa was 17 and 76th in the world when played on a 2009 Masters invite. But not nearly as interesting as Hosung Choi and his swing. Will Gray calls it unique with wild gesticulations. Ryan Ballengee went with fisherman-style that’s been thrown around to the best effect. Josh Berhow mustered up an unconventional designation for the swing. And Christopher Powers cooked up absolutely electric. Frankly, I have no idea how best to describe Hosung Choi’s move but we need to see it on a grand stage, especially now that he’s the Casio World Open winner and world No. 209. That’s a climb from 528th, where he started 2018. Maybe Shottracer on his footwork? BTW, they have tracer on Japan Golf Tour broadcasts? "Here's why the 23-year-old rookie is the future of golf"
And there was the 9-hole Monday practice round at the 2017 U.S. Open at Erin Hills in Wisconsin. Champ, who won just one tournament at Texas A&M, qualified for the national championship and then teed it up with McIlroy before tying for 32nd. And Champ outdrove McIlroy on every hole. GolfChannel.com’s Randall Mell says goodbye to the peculiar LPGA player tendency to have their caddies line them up for a shot, a casualty of the 2019 rules of golf changes. As most commentators have told us, no one can recall when a player was actually called off a shot by a caddie. Mostly, it just provided an annoyance to television viewers and gave some the perception that female professional golfers needed this odd crutch. So why do it? For most players like Lincicome, it’s just reassurance. If the rules allow it, why not make sure? For Lincicome, it also has become part of her pre-shot routine. Lincicome was irritated when she first learned of the rule change, mostly because it was sold as a way to speed the pace of play. Lincicome is one of the fastest players on tour. 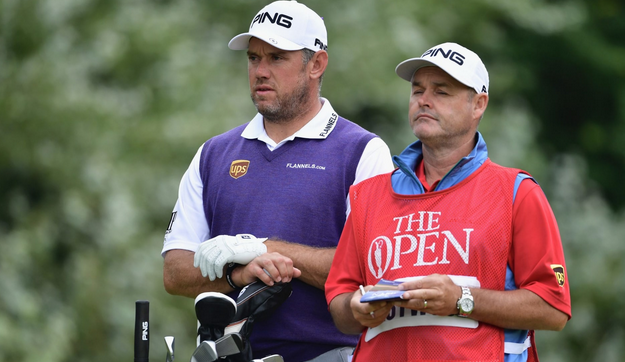 Lee Westwood and longtime looper Billy Foster have officially split, with the move actually happening before the former World No. 1 captured the Nedbank accompanied by his girlfriend, Helen Storey. The split could have reverberations across the bib-wearing circuit when coupled with Matt Kuchar’s win the same week as Westwood while using a local caddy. In Westwood’s case, it was not love that drove him to make the move, but a desire to have a true luggage handler who freed him up to do his yardages and thinking. His best finishes in 2018 all came with either his son or girlfriend toting the bag. “Lee wanted to work differently to everything we had ever done, which basically meant me just carrying the bag,” Foster said. “I struggled to adapt to that situation as a caddie, and it created a bit of an uncomfortable atmosphere on the course. It’s always strange to see a player with all cylinders firing making a big equipment move. But that’s what Justin Rose has planned at years end, reports Golf’s Jonathan Wall, who says if Rose regains No. 1 status he’ll be the first top players since Rory McIlroy in 2013 to make such a move. Two elements of Wall’s reporting are of interest, starting with Taylor Made’s apparently focus on fewer players under new owner KPS Capital Partners. Assuming Rose is no longer in the picture, TaylorMade’s Tour staff for 2019 would consist of Dustin Johnson, Rory McIlroy, Jon Rahm, Jason Day and Tiger Woods, who are all currently ranked inside the top 13 in the Official World Golf Ranking. Then there is Honma, known as a maker of high-end and high-priced equipment now run by former Taylor Made CEO Mark King. It sounds like Rose has wisely reserved the right to not jump into their unproven-at-the-highest-level woods. It’s been reported that Rose’s deal with Honma would require him to play the brand’s irons and wedges but allow him to continue using TaylorMade woods. It’s unclear if he’d continue using a TaylorMade golf ball or switch to a Honma model. G.C. Digital reports on the fine calculations by Golf Channel’s Alan Robison suggesting Brooks Koepka will again take the World No. 1 mantle from Justin Rose, just days after Rose reclaimed the throne (and hopefully assorted bonuses). The 38-year-old Englishman returned to No. 1 in the world – a position he first assumed at the BMW Championship in early September – after his playoff victory Sunday at the Turkish Airlines Open. That moved him just .05 points clear of Koepka. Koepka’s divisor dropped from 45 to 44 in the two-year OWGR calendar, resulting in his average points rising. After this week, Koepka will have 10.32 average points to Rose's 10.16. Might this be a good time to agree to ignoring World No. 1 status for a while? When divisors dictate positioning to this supposedly meaningful throne even as the players in question are sitting at home seems like a solid reason to focus on more important areas? Poll: Will Leaving Flagsticks In The Cup Become A Thing In Pro Golf? I’m still fascinated by the Golf.com exclusive reporting that Bryson DeChambeau’s plans to start leaving the flagstick in for most putts when the 2019 Rules of Golf kick in. Given that he just won his fourth tournament in five starts, DeChambeau’s methodology and madness is bound to have some copycats if he proves it to be a useful way to putt. But some have predicted it will be a visual mess for pro golf, as Hank Haney did. He sees the USGA and R&A having to back off the rule, or face PGA Tour intervention of some kind in the form of a local rule. I certainly can see where the sight of some players wanting the flag tended and others leaving it in could turn greens into a weird game of Twister as caddies navigate through lines and wait to hear from the player if they want the stick in or out. There will also be others who test things out with regulation flags in the green and undoubtedly many opinions what works. The Forecaddie has info on the actual PGA Tour stock flagstick, in case you have COR testing to do. Kerr-Dineen: If the anchor ban provides the precedent, we can deduce that golf’s rules are decided — at least in part — by how the powers that be want the game to look. It’s not something that’s specific to golf. The NFL is a classic example of legislating the game in a way that makes it more marketable. If the bosses upstairs see Bryson putting with the flagstick in and don’t love the look of it, don’t be surprised to see them “revisit” this rule. This trend could go a few ways and I’d would love to hear what you think. I voted for the top one. Especially if Dave Pelz or others do more testing with putts and see no harm in the practice. What will happen in 2019 with flagsticks and putting? "Champ family's road from racism to Tour winner"
Nice work here from GolfChannel.com’s Tim Rosaforte to shed a little more light on the background and development of long-hitting Cameron Champ, winner for the first time on the PGA Tour last week. This on grandfather Mack, who got Cameron into golf and who got the first phone call last Sunday before the winning card was even signed. Francesco Molinari’s breakout 2018 will forever be remembered for his final round Open precision. Paired with Tiger Woods, Molinari never wilted on an unrelenting Carnoustie that exposed the slightest mistakes. Yet as Sean Martin notes in this PGATour.com look at Molinari’s numbers, a sacrifice of some accuracy for distance gained through a combination of fitness and fitting allowed Francesco to pick up enough off the tee to make huge leaps. His tee shots covered 64 percent of the yardage on par-4s and par-5s this season. That's nearly 5 percent more than three seasons ago. He ranked 27th in that statistic in 2018 after ranking 168th (out of 184 players) in 2015. In May 2018, he was up to 114 and 169 mph. He was now carrying the ball nearly 290 yards, more than 25 yards longer than that October 2016 testing session. Molinari’s story is even more fascinating given what an established player he was and what a bold move he made given the number of players who have tried to pick up distance and lost their games. Best of all he did it through a combination of art, science and hard work. Given the direction of the game toward a speed emphasis at younger ages, Molinari may be one of the last we’ll see to make such a big mid-career adjustment.